It was the night of the lighted boat parade in our neighborhood of Eastport. The boat parade, sponsored by the Eastport Yacht Club, is a regular event that draws spectators who line the shoreline and bridge around the three sides of the harbor. 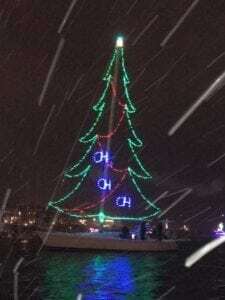 The boats – dressed as angels, Santa’s sleigh, the Grinch, and more – parade in a circle around the harbor. This year, I was on a friend’s boat moored inside the circle serving hot food and drinks to the boats who work behind the scenes to ensure safety. Consequently, we saw the opposite side of all the decorated boats. And that’s the way it is at work. An insightful leader knows that there are many perspectives available aside from the obvious one. It’s easy to get stuck in a rut and fall for the same viewpoint each time but that doesn’t bring creativity or innovation. An insightful leader seeks out alternative perspectives to inform their decision. Here are three tips to cultivating that alternative perspective. Put yourself in other’s shoes. We say this all the time but it’s surprisingly difficult to do. We’re not in someone else’s shoes; we’re in ours. It takes considerable cognitive energy to convince your brain to look at a situation or decision from another view point. To do so, make an effort to think about the person(s) on another side of the situation or decision. What is their background? What are their interests? What work experience do they have that color their perspective? What hot button issues are you aware of? It’s only when you force this level of thinking that you come close to putting yourself in other’s shoes and seeing a new perspective. If not this, then what? When your staff brings a recommendation to you, note if it is a standard recommendation – something that you would expect. This would not be surprising. The brain is designed to take the easiest (lowest energy) path which is to do what it’s done before. To force a new perspective, say, “Thank you for the recommendation. Now, let’s assume that this course of action is not available to us. What would we do then?” By taking the tried-and-true option off the table, you force new thinking. Ask others. The insightful leaders that I interviewed were skilled at asking others for input. It helped them see other perspectives. When you seek out the opinions of others, don’t ask what they would do. Instead ask: “How would you approach this problem?” “What factors would you consider in the decision?” “What are other ways you’ve seen this situation addressed?” These questions evoke a broader, more thoughtful response that is more likely to provide new options for your consideration. Whether it’s within your work, your community or your family, there’s value in making an effort to see other perspectives. And nationally, in this time where it seems that divisiveness flourishes and there is little effort to understand alternative viewpoints, perhaps we can all take a moment to find appreciation and respect for our differences and similarities. After all, “oh oh oh” and “ho ho ho” are just two sides of the same boat. Posted in Leadership, Neuroscience by Shelley Row on Posted on December 18, 2017 by Shelley Row.